Scroll down to see our selection of Medical Thermometers for sale. Thermometers that we sell are a device used to measure the body temperature for medical diagnosis. 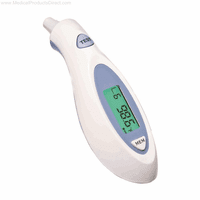 We carry most brands and styles of medical thermometers including the digital thermometer, ear thermometer, pediatric thermometer, instant thermometer, rectal thermometer, non contact thermometer, fever thermometer and many more. Thermometers are used for many medical diagnosis's. Since compact and inexpensive methods of measuring and displaying temperature became available, electronic thermometers, often called digital, because they display numeric values, have been used. A typical inexpensive electronic ear thermometer for home use has a displayed resolution of 0.1 °F, but a stated accuracy within ±0.2 °F when new. Electronic thermometers may work by contact (the electronic sensor is placed in the location where temperature is to be measured, and left long enough to reach equilibrium). Some of these thermometers take a few seconds, some are instant. Other electronic thermometers work by remote sensing: an infrared sensor responds to the radiation spectrum emitted from the location. To eliminate the risk of patient cross-infection, disposable probe covers and single-use clinical thermometers of all types are used in clinics and hospitals..